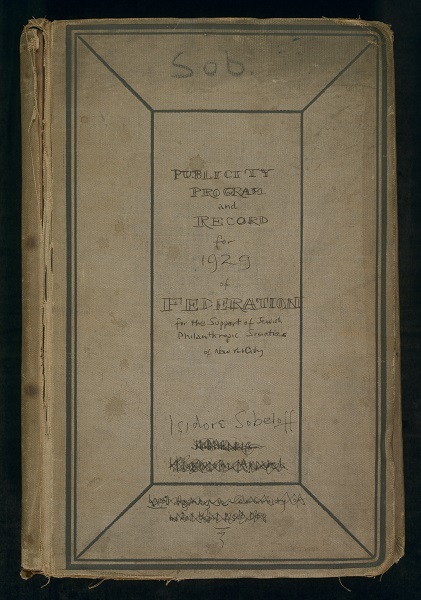 Isidore Sobeloff, the Director of Public Affairs for the Federation for the Support of Jewish Philanthropic Societies of New York, compiled a scrapbook of material that his department created in 1929. The scrapbook was held by the Sobeloff family and was recently donated by Susan Sobeloff to the UJA-Federation of New York Archives Project in March. Since March, the scrapbook underwent preservation treatment and has been digitized and made available online. The scrapbook, in many ways, reads both like the history of a tumultuous campaign year and, also, like an artist’s portfolio, highlights his decisions as the director. 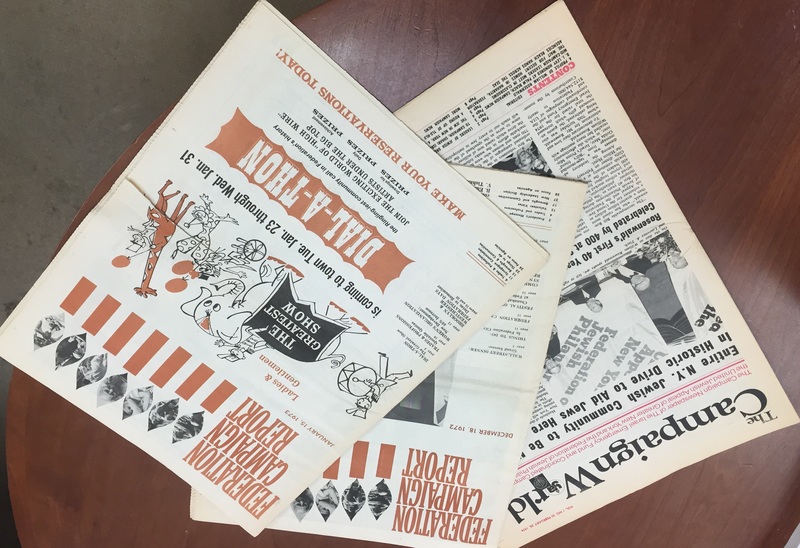 Clippings mention Federation agencies and fundraising effort and publications illustrate how the department was the ambassador or mouthpiece for the philanthropic organization. 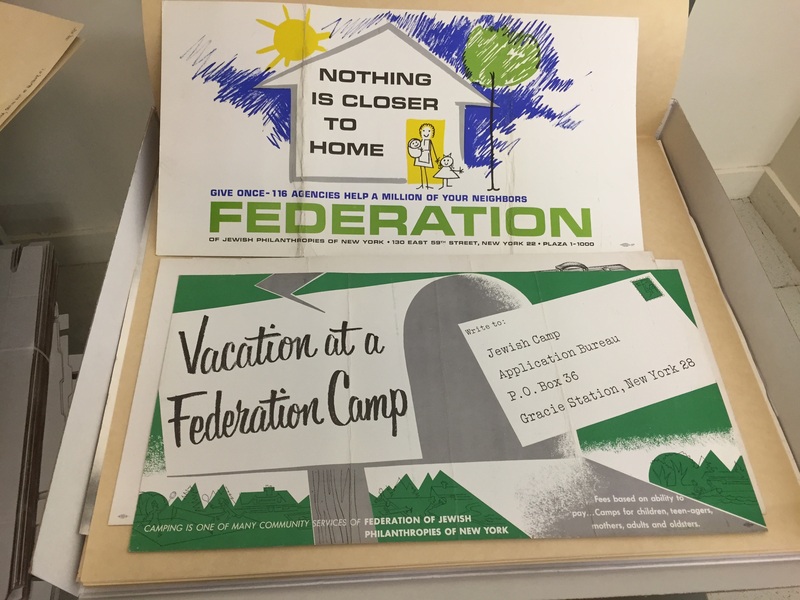 The scrapbook documents the activities of Sobeloff and the Public Affair Department during a time period for which we have very little archival material, both before the Public Affairs Department started to be called the Public Relations Department and before the Federation merged with the Brooklyn Federation of Jewish Charities to become the Federation of Jewish Philanthropies of New York. As we look back at 1929, we must divide the planned program into the period referred to until now and the period from immediately after the market collapse until the end of the year. Out of all the confusion came the decision that our public had to be convinced that giving to Federation was a constant all-year-round problem unaffected by outside factors; that regardless of business conditions, the work of healing and mercy must go on. The scrapbook details some of the decisions made to prompt campaign pledgers and workers to give and meet their commitments both in spite of the crash and, ironically, to help deal with even greater need because of the crash. 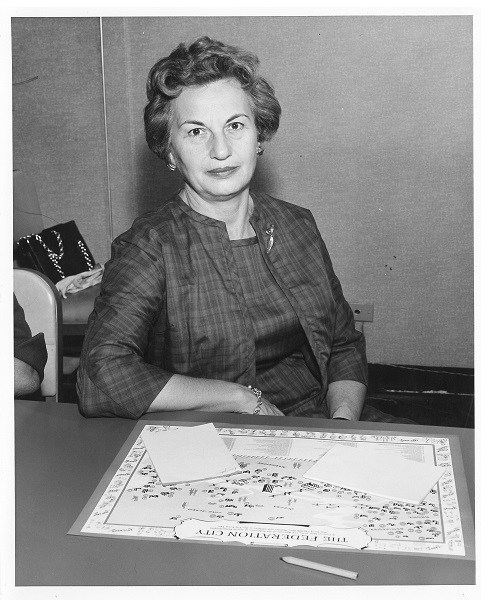 Later, Mr. Sobeloff relocated to Detroit to become the executive director of the Detroit Federation. His oral history is digitized and available. In his oral history interview, Sobeloff recounts his training in Jewish communal service, time as Director of Public Relations for Federation for the Support of Jewish Philanthropic Societies of New York, and his experience as a communal leader in Detroit from the 1930s through the 1950s. Special thanks to Susan Sobeloff for her donation of the scrapbook to the American Jewish Historical Society on behalf of the Sobeloff Family. As we approach the end of our project, we are starting to tie up some odds and ends regarding the arrangement and housing of the collection, before we move into finishing the description of the collection in the finding aid. Although we have almost 2000 bankers boxes, there are still some items that just don’t fit, and these items are deemed “oversized material.” We now have 18 oversized boxes holding maps, charts, blueprints, newspapers, photographs, scrapbooks, plaques, and other items that need to lie flat for optimal preservation. These 18 boxes are different sizes themselves, and range from OS (oversized) 1 to 3, with the largest items in a flat file cabinet. 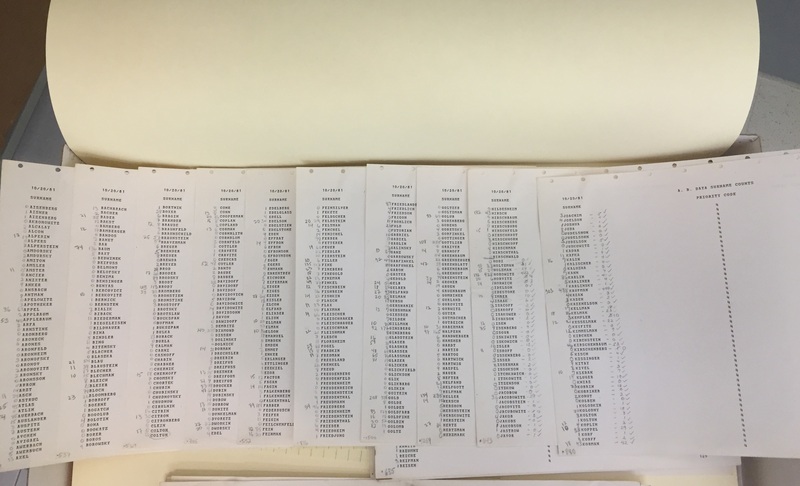 Processing is for the most part complete on the UJA-Federation of New York collection and we have moved on to everything else that has to be finished before the finding aid is completed, with just Marvin left to complete the last reboxing, refoldering, and folder listing. In cleaning up my processing area I am finding things I stashed away during processing, not to integrate into the collection but because they represent a very ephemeral part of what archivists do, and I had a hard time throwing them out. Perhaps a later blog post will illustrate some of the beautiful and weird paper clips that Federation used at different times between 1917 and whenever paperclips became more standardized. But first I scanned a few of the empty folders and tabs I couldn’t bear to throw out without noting them in some way. The contents of these folders were transferred a couple of years ago to new acid-free folders and probably relabeled. Or possibly the titles were retained. Once all the folder lists are combined into a single final container list, I’ll be able to search for “CRANKS” and see if that folder title merited permanent retention. In fact at that point, with the finding aid and container list online, anyone will be able to search for any folder title or strange word they like and see if it exists among the tens of thousands of folder titles in this collection. I know that we came across a number of folders over the past four years that made reference to mail that had been received that was either troubling, or from a troubled soul not seeking help from Federation but on an opposite side of some philosophical or political issue, real or otherwise. 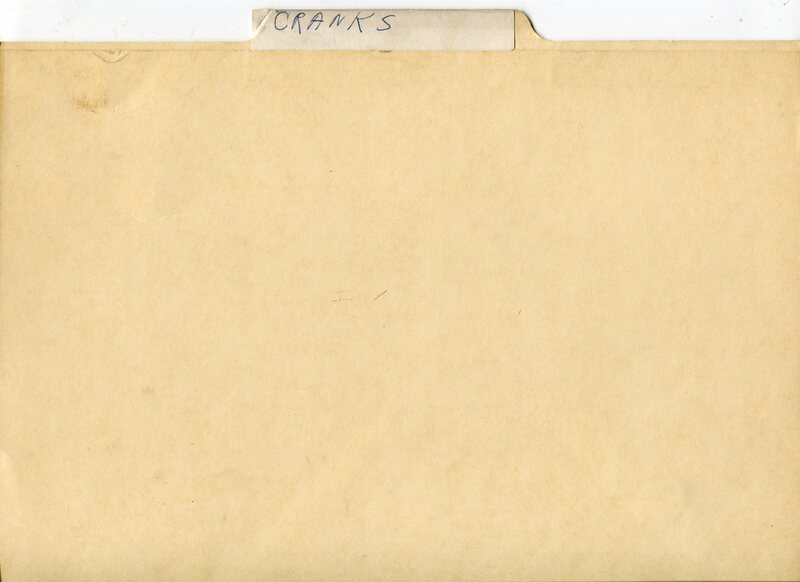 These other folders would have been called “White Mail” or “Unsolicited Correspondence” or hidden within a series of correspondence folders, making a title like “CRANKS” really stand out. Being handwritten, probably the only handwritten folder title in a box of folders with neatly typed titles also made it stand out. I assume it was handwritten because it was not a formal folder title; the executive who was dealing with its contents just scribbled a title himself and left it on his desk to work on, rather than handing it to his secretary to integrate into the departmental files. This next image is a folder tab from a very brittle and dusty folder from about 1920. “VI Eliminated Societies” is also handwritten, but one of an entire years’ worth of handwritten folder titles, definitely a formal folder title and labeled very formally and neatly. It is also numbered as if it were an official category, which at that time in the ‘teens or 1920s it must have been, until Federation settled into a more stable and comfortable relationship with their affiliated agencies. As the project slowly winds down, we have been discussing the things we’ve learned from and noticed about this collection. One of the most ephemeral things is simply how folders are labeled, what that says about the institution, and what it says about the time and place a particular person wrote a particular title on a folder in a particular way. One thing I’ve been very aware of is how the documents and other materials in this collection reflect that time and that person and that institution, and how all of that affects the content itself. 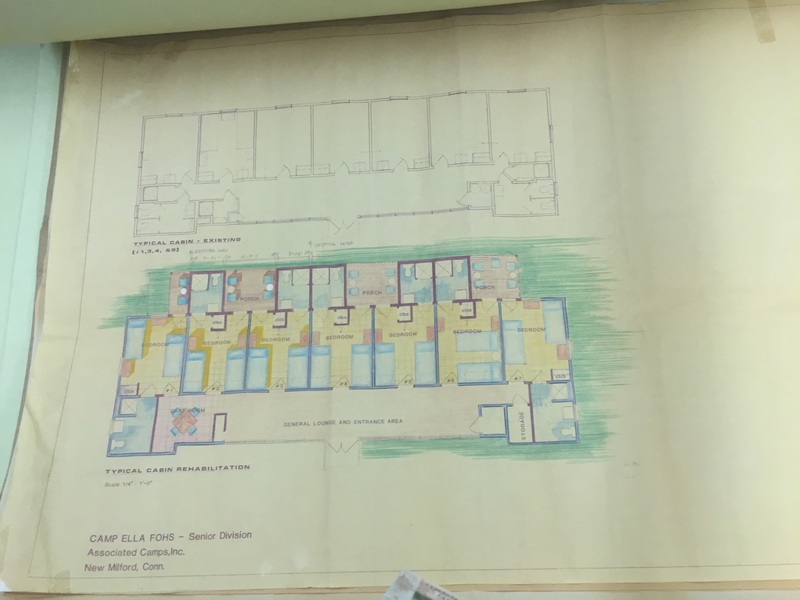 Our hope is that we are presenting the collection so it is easily accessible, but also as an intriguing series of snapshots of an ordinary office over time, vanished except for the records a lot of people so carefully kept. Through its history, Federation issued maps showing the range of their affiliated agencies across the New York metropolitan area. Some iterations were closely based on earlier maps and were simple updates. In 1961 a stylized version of the New York City map became the basis of a design overhaul; this version was updated a few times in the 1970s, with further updates probably through the 1980s. The different versions of these maps that have turned up in the collection during processing have been digitized and made available online. 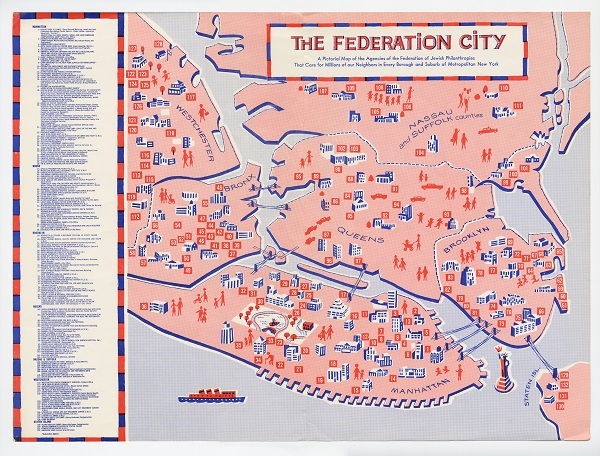 The map above, undated but clearly from the 1970s, was selected as the starting point for an interactive map of Federation agencies. We chose to maintain the stylized look of this map, which is not to scale, and have therefore not used strict global positioning of the pins on the map. Instead, the pins, each representing one location of a specific agency, are located generally in the correct part of a borough or in the general vicinity of its location in an outlying county around New York City. Federation’s reach eventually extended to Westchester, Long Island and New Jersey, particularly for summer camps and other facilities responding to a community need, and this is reflected in the map. 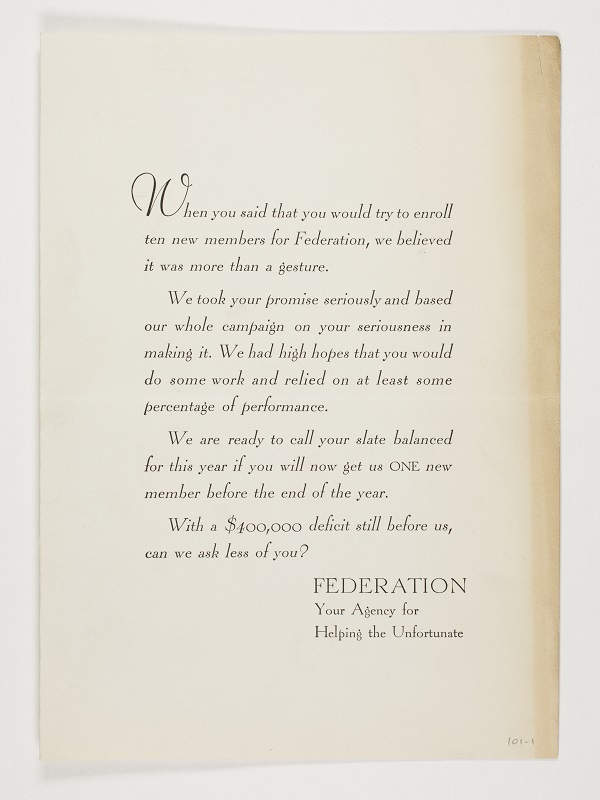 We extracted a large amount of data from the collection itself, primarily addresses of the agencies and the dates of their affiliation with Federation – this information was readily available in the voluminous annual agency budget files processed early in the project and which you may remember from earlier posts. We have also included histories of many of the agencies, with information pulled from various publications and files in the collection, which appear in pop-ups when you click on a specific agency. Where photographs of the agency buildings exist, they have been added to the histories. Before the end of the project we plan to add more histories and photos as they are available. Until an agency has a linked history, just the name of the agency will appear when you click on the pin or when you click on the name on the sidebar. Working with our website developers, A+R Media Studio, LLC, has been an exciting experience, not least because of the enhancements they suggested that have made the map even more interactive than originally planned. When you play around with the map, make sure to adjust the timeline across the bottom. If you set it on the shortest date range and start it all the way to the left, press the arrow to start an animated picture of Federation’s growth and reach during the 20th century. If you set the timeline for the longest date range, and filter the categories on the sidebar on the left to “select all”, you will see all of the agencies through all of Federation’s history. Click on an agency name on the sidebar to see where it is on the map. Or click on a pin on the map to see the name of the agency. We hope you will agree that this map works as a visual reminder of how large an impact Federation has had in the field of social services throughout New York City, and how that impact grew over time.